As a member of SNCAE you are equipped with several resources as future education professional. Access to teacher resources, information on advocacy, scholarships and more! Connect, build, and empower with other pre-service and current educators through conferences and professional development. For an online community that has information on every aspect of teaching, go to http://www.owl.org (you'll need your membership card number for full access). For information on how to get involved with the national program, go toNEAStudents.org, and click on the "Future Teachers" link. 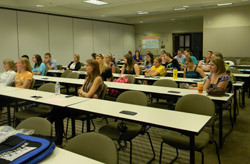 UNCW SNCAE is thrilled to offer professional development workshops for future leaders in education! We have the ability to provide SNCAE/NCAE/NEA workshops for our chapter at no additional cost. NCAE is available to provide assistance with workshops if needed. Workshops will be hosted by SNCAE. Topics range from professional learning to growth as an educator beyond the classroom. Visit NCAE.org for potential workshops we could bring to our chapter. Remember to contact your local NCAE chapter President along with UniServ! To access this information visit NCAE.org, contact the state office at 1-800-662-7924, or contact a UNCW chapter officer.